Pink Floyd are streaming a 1968 performance of their 1966 classic, “Interstellar Overdrive”, as the latest entry in their ongoing vintage video series. 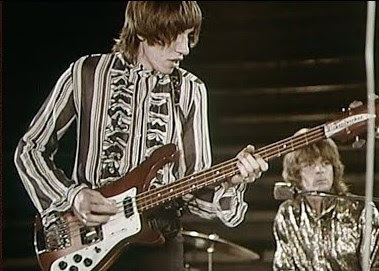 The footage captures the band’s May 6, 1968 appearance at the Rome Pop Festival. Written as an improvised track by all four members of the group, “Interstellar Overdrive” appeared on Pink Floyd’s 1967 debut, “The Piper At The Gates Of Dawn” – the set reached No. 6 on the UK charts and No. 131 on the US Billboard 200 upon its original release while going on to be hailed as one of the greatest psychedelic albums of all time. “Interstellar Overdrive” often opened the band’s shows in the mid-to-late 1960s, but disappeared from the lineup for concerts after 1971. Drummer Nick Mason opened his 2018 live dates with the tune, and fans will be able to hear it and more songs from the project this spring when Nick Mason’s Saucerful Of Secrets perform vintage material by the group on a spring tour of North America that will begin in Vancouver, BC on March 12. Pink Floyd delivered the No. 1 Rock News Story of The Year and were named the No. 2 Rock Artist Of The Year as part of the 2018 hennemusic Rock News Awards.